Histological techniques. 2. Fixation methods. Atlas of plant and animal histology. There are several methods for fixating tissues that are selected according to the type of fixative, the structure to be fixed, and what we want to observe. Fixation methods can be grouped in two: physical and chemical methods. Physical fixation is accomplished by either very quick freezing or heating at high temperature of samples. These procedures are used when chemical fixation affects the tissular structures we are interesting in, when a very quick fixation is required, or when the technique or the tissue need physical fixation. Quick freezing is a suitable method for preserving molecular features of samples because they are nor affected by any external chemical compound. Freezing must be very fast to prevent autolysis of the cells and formation of large ice crystals that may destroy the tissue structure. Thus, it is convenient to process sample sizes not larger than 2 mm so that freezing is homogeneous through all the tissue thickness, including the inner parts. If it is possible, before freezing, the samples should be pretreated and protected by a cryoprotectant that prevent cellular freezing damages. A very fast freezing is achieved by immersing the samples in isopentane (-170 ºC) cooled in liquid nitrogen (-196 ºC), or in dry ice and acetone (-70 ºC), or even in liquid helium (-268 ºC). Cryoprotection is always a good practice, although it is not always possible. Dimethyl sulfoxide, glycerol, sucrose or mixed solutions containing some of these substances are the most common cryoprotectants. Once the freeze sample is sectioned, the tissue is melted and should be somehow protected, unless it is both sectioned and kept in a freezing chamber. Lyophilization, or freeze-drying, and cryosubstitution are techniques that remove the water (the ice) from frozen samples by sublimation, that is the water is transformed in gas from ice without going through the liquid intermediate state. These techniques prevent chemical reactions happening in aqueous environment, allowing a long-lasting preservation of the tissue. Cryosubstitution consists in the slow exchange of ice for a fixative solution. Thus, fixation is done in tissues that did not get degraded because they were frozen. Fixation by heating is not common in histology because it introduces damages in the tissues. Heat coagulates proteins and dissolves lipids. However, it is a good fixative method for microorganisms because their morphology is preserved, and that helps in the identification. Nowadays, heating fixation is combined with chemical fixation. For example, samples are immersed in a chemical fixative and microwaved at 55 ºC. This temperature does not produce artifacts, increases the fixation speed, and decreases the fixation time from hours or days to minutes. Microwave is a good heater because temperature rises quite homogeneously and immediately through the sample. Heating baths are not recommended because produce a heat gradient between the outer to the inner parts of the sample. It is thought that the increase of the fixation speed by microwave fixation is a consequence of the heat and not of the microwaves. Microwaves are sometimes used in later steps of the histological processing, particularly during staining. Chemical methods use aqueous solutions containing fixative substances that make bridges between tissular molecules and results in the immobilization of the tissular compounds and prevents degradation of the tissue sample. Chemical fixatives affect tissues both chemically and physically. Retraction, distension, and hardening are common physical effects. There are two major chemical methods: immersion and perfusion. In any case, the fixative should get to all the regions of the sample as soon as possible. 1) The piece of tissue should not be larger than 0.5 cm in thickness to allow the fixative enters the deeper part of the sample before the cells start to get damaged. Penetration speed depends on the fixative type and the tissue to be fixed. The size of the sample should be considered according to the fixative type. Slow diffusion fixatives are recommended in samples not larger than 0.2 cm. Tissue features need to be considered. For example, fixation penetration is faster in loose tissues or samples with large spaces for diffusion. 2) The volume of the fixative needs to be 10 to 20 times larger than the volume of the sample. 3) Osmolarity of the sample and the fixative solution need as similar as possible. 4) The pH of the fixative solution should be close to the physiological pH of the sample. 5) For a similar type of sample, fixation time depends on fixative features: diffusion and fixation (intensity and speed of making bridges between proteins or how quick proteins coagulate). The fixation time must be enough for a proper fixation, but not excessive because it may cause artifacts in the sample. A gentle agitation of the sample during fixation is recommended for increasing the fixative penetration, which reduces the fixation time. 24 hours of fixation is common for most of the fixatives. However, for some of them, like formaldehyde, fixation time may last for a week. Fixation by perfusion of an organ. By perfusion, the fixative solution reaches every cell of the organ via the vascular system. 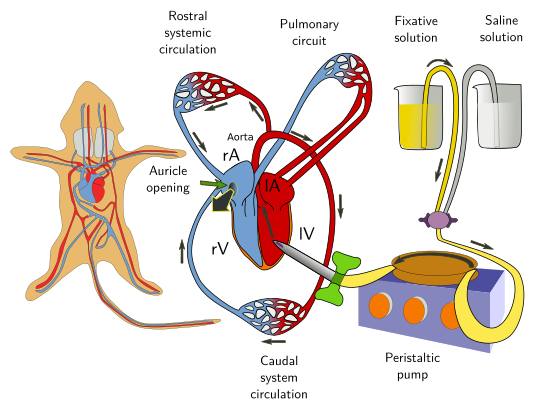 A peristaltic pump introduce the fixative through an artery that supplies the organ. All the blood vessels that do not conduct blood toward the organ are closed. Perfusion. In this fixation method, the fixative solution is introduced through the vascular system and reach all the cells of the tissue via capillary net. It is possible to fix a whole animal if the fixative solution enters through the left ventricle of the heart. Then, the fixative solution is driven through the vascular branches of the arteries coming from this ventricle. If we want the fixative in the lungs, the fixative solution is introduced through the right ventricle. 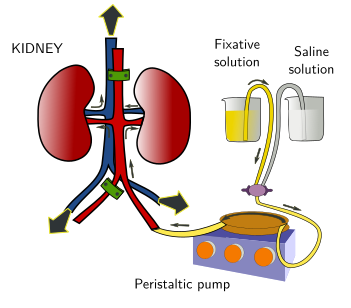 By perfusion, a single organ can be fixed if the fixative solution enters by the main artery that irrigates the whole organ. Fixation by perfusion is not always possible, like in many biopsies or in plants. Fixation by perfusion is more effective than fixation by immersion because the fixative solution gets in contact with all cells of the perfused structure very quickly. In this way, the penetration speed of the fixative is not a limiting feature. Before the introduction of the fixative in the vascular system, the blood should be removed with an oxygenated saline solution. Otherwise, the fixative may fix blood, coagulates it and produces thrombus. This may seal some parts of the vascular circuit that prevents the fixative solution entering some parts of the sample. As in the fixation by immersion, the pH and osmolarity of the fixative solution, and the fixation time, must be set properly. Fixation by perfusion of a complete animal. The fixative solution is introduced through the vascular system. Pressure is provided by a peristaltic pump. The fixative solution enters via the left ventricle (lV) and reach the aorta. This artery and its branches distribute the fixative through the body (excepting the pulmonary circuit). The fixative arrives to and fills the capillary net, where most of the fixation process occurs. After that, fixative solution is gathered by venous system that converges in the right auricle (rA). This heart chamber is opened with a small cut to open the circuit and allow the fixative solution to leave the vascular system and the body. lA: left auricle; rV; right ventricle. Another parameter to keep in mind is the pressure of the fixative solution when entering the sample, which should be similar to the blood pressure in the living animal. A lower pressure may prevent the fixative solution to reach every capillary duct of the sample, but a high pressure may break blood vessels and the tissular structure.